Please don't write to us and ask questions that have been addressed here. This FAQ exists to help you, please read it and use it to your advantage. Also, don't email and ask us to predict the weather or airline schedules during the time you are thinking of visiting Ofu. We're not blessed with this sort of precognition. We live in a separate house behind the lodge and respect your privacy. We will be there to meet you when you arrive and one of us will usually be nearby in case of emergency. If we are free, we will be more than happy to chat, or if you prefer alone time, you've got it. We have other responsibilities and can't always socialize as much as we would like, but we are available to answer any questions, provide recommendations and advice, and help in any way possible. Also, we have dogs and cats, you may see them in the yard, but they won't be in your space. OK . . . SO HOW DO I PRONOUNCE THE NAMES OF THESE PLACES? A: No. Please plan to bring cash or traveler's cheques. And, no, there is no ATM on Ofu. There are ATM locations near Pago Pago airport at KS Mart and Bank Of Hawai'i. Stop by an ATM just before you leave for Ofu and grab some cash. A: Pack light, pack smart. Due to the small aircraft that fly between the islands and the length of the runway, Samoa Airways (formerly Polynesian Airlines) limits passengers to 20-kg (44-lbs) of baggage on flights bound to Ta'u. Ofu-bound flights limit passengers to only 5-kg (11-lbs). The 20-kg limit is valid for flights departing Ofu. This means, it's better to fly into fly to Ta'u and take an alia boat to Ofu and fly out of Ofu if you are not traveling very light. Hawaiian Airlines limits Pago Pago passengers to 50-lbs checked bags. There are no clothing stores on the island and the local bush stores have a very limited selection of non-food supplies. Bring your snorkeling gear and load your tablet with some good books! Be sure to pack mosquito repellent and sunscreen. A: Shorts and T-shirts will do fine almost anywhere on the island. Manu'a Islanders are culturally conservative, therefore modest swim wear is expected when you're on the beach. Men and women alike are welcome to wear lavalavas at any time. Bring good walking shoes or sandals. Keens are a nice all-around solution. You're also gonna need a hat to protect yourself from the sun. It would be wise to pack a change of clothes in your carry-on as well as your important documents and snorkeling gear in the event your checked bag is bumped off your flight due to weight restrictions. This doesn't happen often, but it's better to be prepared than not. I'M A GLUTTON FOR PUNISHMENT, IS THERE A BOAT THAT I CAN TAKE TO OFU? A: Yes, however its sailing days are difficult to predict. The boat is primarily for freight and not the most accommodating vessel on the high seas as far as human beings are concerned. Choose this route only if you are very sure of your sea-worthiness! The eastern voyage to to the Manu'a Islands is against the ocean's current and prevailing winds and therefore is rough. The night at sea will be chilly, and it's likely you'll get wet. If you don't get seasick, someone near you will. The crossing takes several hours depending on weather and seas. If you're very lucky they will call on Ofu before leaving out for Ta'u, otherwise you'll wait it out at Ta'u island while the vessel is unloaded. If they can't make it into harbor they will unload outside the harbor onto small boats and ferry cargo and passengers to shore. Bear in mind that this will take no small amount of time to accomplish. If the boat can't enter Ofu's harbor, a similar protracted ferrying operation will ensue. Contact MV Manu’atele at 684-633-4701 which makes the Manu'a run in 6-8 hours depending on weather and seas. $35/person one way + $1.50 for each cubic foot of cargo. It's supposed to depart for Manu'a every Wednesday evening. but it's best to verify the schedule in advance. WHY HAVEN'T YOU ANSWERED MY EMAIL OR CONFIRMED MY RESERVATION REQUEST? A: If more than a week has passed since your message to us and you are concerned, please telephone us at 684-655-1120. Due to Ofu's remoteness, we may be having internet connectivity issues. Our social media guy Terry (based in the mainland U.S.) is a journeyman Ofu traveler [I made my 27th trip in May 2018 --Terry] and is available to help with answers to your Ofu Island travel questions and can try to contact the lodge on your behalf. Have a lot of questions or need a quick answer? Don't hesitate to give him a call! Terry can be reached via telephone during evening hours (Central Time) at 563-484-0004. HOW DO I GET FROM THE MAINLAND U.S. TO OFU? A: Catch Hawaiian Airlines to Pago Pago. You'll connect through Honolulu. We recommend flying to the west coast from your home city and spending the night there on the way down and coming home. Hawaiian Airlines serves Seattle, Portland, San Francisco, Sacramento, San Jose, Los Angeles, Oakland, San Diego, Phoenix, New York (JFK), and Las Vegas. It's a long flight to the islands of American Samoa and you'll appreciate the rest. Alternately, spend a day or two relaxing in Honolulu on your way down and back instead of a west coast city. Hawai'i is almost as nice as Ofu! Flight time from Hawai'i to Pago is five hours. Hawaiian Airlines Pago-bound flights from Honolulu are on Mondays and Thursdays. Plan on spending at least one night in Pago Pago. Flights to the Manu'a Islands usually leave in the morning or early afternoon and take about 25 minutes to reach Ofu Island, 30 minutes to Ta'u. HOW DO I GET FROM [MY HOME COUNTRY] TO AMERICAN SAMOA? Talofa Airways has daily flights between Apia and Pago Pago and two flights per week between Pago and Tongatapu, Tonga. Hawaiian Airlines also serves Australia, Tahiti, South Korea, Japan, Taiwan, and China, but will require a connection through Honolulu before traveling on to Pago Pago. Samoa Airways connects Apia with Auckland and Sydney. Keep in mind that if you are coming/going via Apia you will be crossing the International Date Line. In other words, even though it's a thirty minute flight, if you leave Apia on a Monday you will arrive in Pago on Sunday. If you leave Pago on a Monday you will arrive in Apia on Tuesday. WHAT DOCUMENTATION DO I NEED IN ORDER TO ENTER AMERICAN SAMOA? A: US citizens and nationals must have a valid (non-expired), machine-readable US passport. If your passport is expired or lost, you may apply for an "OK BOARD" to enter the Territory. Read more HERE. All foreigners are required to obtain Entry Permits in order to lawfully enter American Samoa. There are circumstances where Entry Permits are not applicable. Those circumstances require travel authorizations referred to as "OK Boards" in order to enter. Certain foreign nationals must apply for an "OK BOARD" via the Entry Permit Waiver Program. Details HERE. More information is HERE. So . .. yeah. The American Samoa Government, in their never-ending efforts to kill tourism in the Territory, has made this process as confusing as possible. Basically, if you are coming to us from anywhere other than the United States, please exercise your due diligence and fully read and understand the information linked above. A: Airfare from Honolulu to Pago is around $1000. Airfare from the west coast is around $1400. As is usual with airfares these prices are subject to change. The HNL-PPG fare does not vary too much and fare sales for this route are practically non-existent, you will save money by booking on the cheap for the Honolulu leg of your journey. In most cases, booking at least 30 days in advance will result in the best fare. Hawaiian Airline's website typically has the lowest fares and saves you booking fees charged by some travel websites. HOW DO I GET TO OFU FROM PAGO PAGO? A: As of March, 2019, Samoa Airways (formerly Polynesian Airlines) operates two flights a week to Ofu and four flights a week to Fitiuta Airport on nearby Ta'u Island. The Ofu flights are on Tuesdays and Thursdays. The Ta'u flights are on Mondays, Tuesday, Wednesdays and Fridays. If you fly on the Ta'u flights, we can help to arrange boat transport to get you to and from Ofu. Samoa Airways fares for these flights are about $170 for adults and $160 for children under 12 years old. Manu'a Island flight reservations for flights through August 11, 2019, can be booked by phoning Samoa Airways office at (684) 699-9126 or 699-9127 or contacting them online. Ask the agent that books your flights to send you the credit card form in order to pay for your reservation. Booking agent Stanley Nansen can be emailed at snansen@samoaairways.com. Make certain that your reservation has been paid for within 24-hours of departure or Samoa Airways automatically cancels it. If you wind up flying to Ta'u Island, we can help to arrange boat transfer from there to Ofu. Contact us shortly before you travel from Pago to Manu'a. Ta'u-Ofu boat transfer runs about $150 per trip for one to three passengers, but the price is subject to change based on gas prices and sea conditions. You should expect to tip the driver who takes you from Ta'u airport to the harbor -- about $20. Upon arrival at Ofu harbor we'll pick you up and transport you to the lodge free of charge. Alternately, if you'd prefer to fly out of Ta'u, we can help arrange a boat to transfer you you from Ofu to Ta'u. It bears mentioning that there are no boats making the crossing on Sundays. CAN I RENT A CAR ON OFU? A: There are no rental cars on Ofu. Hitching a ride is an accepted and safe way to get around Ofu and Olosega. You can walk from one end of Ofu to the other in an hour or so, and the National Park Beach is a fifteen minute walk down the road from your door. A: Yes. Even U.S. citizens should travel with a passport when coming to American Samoa. Info on getting your passport is here. CAN I FLY TO PAGO PAGO NON-STOP FROM THE U.S. MAINLAND OR OUR HOME COUNTRY? A: There is no non-stop flight to Pago Pago. You must connect through Honolulu or Apia, so unless you live in Hawai'i or Samoa you'll be stopping along the way. WHAT TIME OF YEAR IS THE BEST TIME TO VISIT OFU ISLAND? WHAT'S THE WEATHER LIKE? A: That depends on what you mean by good! The cool/dry season is May through October. Keep in mind that Vaoto Lodge is on a tropical island 14-degrees south of the equator, so you can expect our "cool and dry" season to be somewhat warm and wet! You can't have a rain forest without rain and it typically will rain a little every day no matter what time of year it may be. That being said, temperatures and humidity tend to moderate slightly during the dry season. More specifically and locally, between May and September the sun swings northerly and keeps our side of the island cooler, somewhat out of the direct sunlight and during much of the day the lodge area is in the shadow of the mountain. On the other hand, the wet season is steamier making for a warmer lagoon and a more verdant jungle. If the trade winds are blowing, humidity is much less of a factor. A: No. There is wonderful air conditioning in Los Angeles hotel rooms and Sydney hotel rooms and Honolulu hotel rooms. The air in our cabins is uniquely conditioned by the South Pacific Ocean, trade winds, and the rainforest and requires no tampering on our part. Fall asleep to the sounds of the sea and the jungle or rain on a tin roof instead of a droning machine. We think you'll find it quite pleasant! All of our rooms have a ceiling fan, an oscillating floor fan, and louvered windows (with screens) that can stay open in all but the worst weather. WILL I NEED AC POWER ADAPTERS FOR MY ELECTRONIC GEAR ? A: American Samoa uses US-style 115-volt electrical power and our island is powered by a solar grid. All of our rooms have power. If you're coming from the States, no adapter is needed. WILL MY CELL PHONE WORK ON OFU? A: Consult with your phone provider, but probably not. It's unlikely that your mainland phone will work. See this as your opportunity to get away from it all. Alternatively, you may be able to purchase a SIM card from ASTCA or BlueSky in Pago Pago that will work on Ofu. If the island's internet is working, a Google Voice/Hangouts Dialer number over a wifi connection will allow you to connect to phones back home. Other VOIP options should also work. A: Unlike some areas of Samoa, Ofu's surfing is not great. Our broad fringing reef rises abruptly from the open ocean and becomes so shallow that many portions of it are exposed during low tides. Large coral heads dominate our lagoon, most within inches of the surface at high tide. The wave action is typically in the 4-8 foot range but breaks fast and erratically into the calm of the lagoon. It may be difficult (impossible?) getting a surfboard on the small aircraft which serve the Manu'a Islands. Perhaps an Uli Board would be a good bet. CAN I HIKE ON OFU AND OLOSEGA? A: Yes, however, hiking up Olosega's Piumafua mountain is not recommended. You will have to secure permission from Olosega village officials if you want to make this hike and we are not in a position to help you make contact. Similar permission may have to be found to hike to Maga on Olosega. If the National Park ranger is on island, he or she may be able to help out. Bring proper shoes and pants for any hike you intend to tackle. We have no reliable contacts or information about hiking possibilities or accommodations on Ta'u Island. Any hikes or swims that involve passing through Ofu or Olosega villages are forbidden on Sundays. These hikes include (but are not limited to) Maga Point, Tumu Mountain, and Piumafua Mountain. Sunday is a day for rest and villagers would prefer privacy. The National Park beach is open on Sundays, as is our area around the lodge and airport beach. CAN I SCUBA DIVE AT OFU ISLAND? A: At this time there are no SCUBA facilities on the island. Unless you'll be pre-shipping a compressor, tanks, and gear for yourself you'll have to be content with our unparalleled snorkeling. SCUBA divers should be aware that the nearest functional decompression chamber may be as far away as Fiji or New Zealand -- DAN insurance would be a wise investment. A: Yes, Ofu's water is safe. Bring a water bottle or flask and fill up before heading out for the day. CAN I PRE-SHIP ITEMS TO MYSELF AT THE LODGE? A: No. The US Post Office does serve Ofu Island, however it is extremely unreliable and your parcel will likely become lost. I WANT TO VISIT TA'U ISLAND. WHERE DO I STAY? A: At this time Ta'u Island has no hotel-like accommodations suitable for tourists that we are aware of. If you're intent on spending any substantial time on Ta'u we recommend using the NPS homestay program. See the National Park's website for details. WHERE ARE MARGE AND TITO? 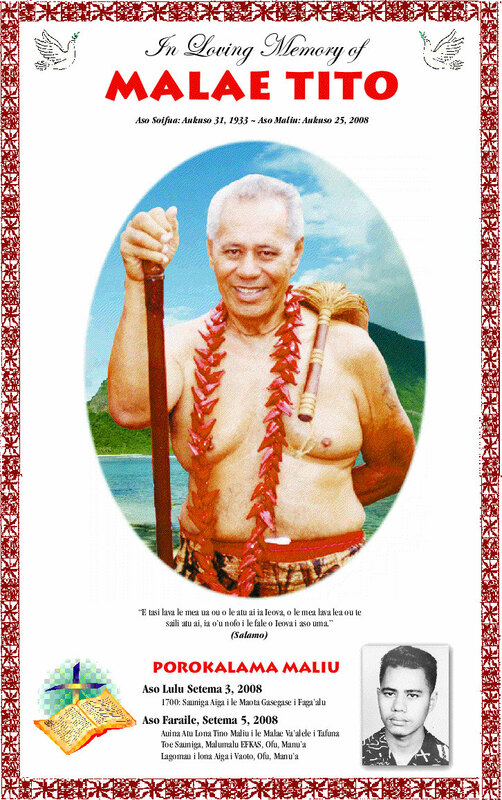 A: Malae family patriarch and Vaoto Lodge founder Tito Malae passed away on August 25, 2008. He will be greatly missed by not only his family, but his friends and all who've visited Vaoto Lodge since he first opened the doors in the '80s. Many guests will always remember sitting with Tito at sunset and listening to him talk story about growing up in Manu'a in the old days. 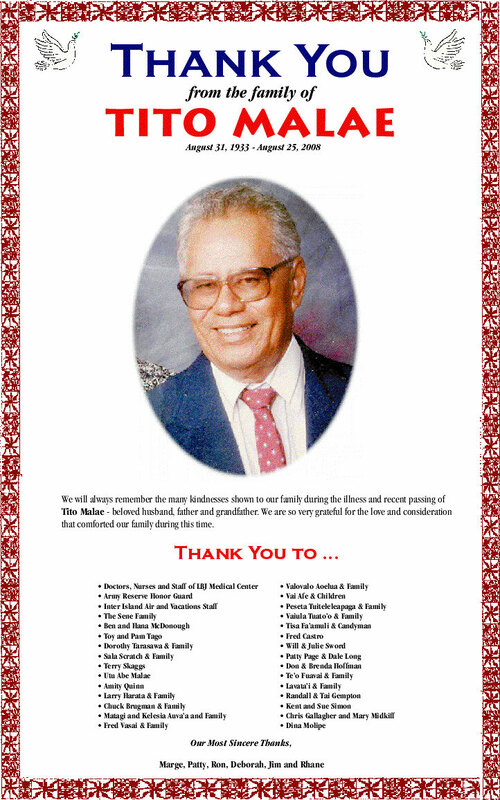 The official newspaper announcements from the family has been archived here and here. On May 10, 2015, Marge Malae passed away at her home at Vaoto Lodge after an extended illness. Both are interred on the grounds of the lodge. Contact the lodge via email at vaotolodge@gmail.com or phone at 684-655-1120. Depending on your phone provider, this will likely be an international call (read: not cheap). Terry uses pay-as-you-go mobile provider Ting which includes American Samoa as a free-to-call country. Check them out and get a $25 credit after you sign up and activate service using this link. “you pretty much have the beach to yourself"